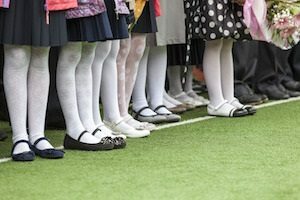 The wrong back to school shoes can hurt a child’s feet by causing ingrown toenails, calluses, hammer toes, bunions, open or raw sores on the feet, heels or toes, and other toe issues. They can also lead to creating a heavy sweat that may lead to athlete’s foot, especially if the child is in sports. If the child already has a condition, such as high arches, weak ankles, or flat feet, the wrong shoe can create pain and reduce mobility and performance. What are the Proper Back to School Shoes? Shoes should meet specific, age-appropriate criteria to be considered the proper back to school shoes. This criteria encompasses the material the shoe is made from, the types of shoes child(ren) can wear, and the correct fit to ensure a pain-free experience. Man-made materials are not known for being breathable or flexible, two qualities that all active children need for maintaining cool, dry feet. Proper ventilation provides better resistance to fungal infections such as athlete’s foot or toe fungus. Natural materials will provide the flexibility and circulation that maintain good foot health throughout the school year. School-aged children (as young as six) will want a variety to choose from. Acceptable shoe types include sandles, tennis shoes, high tops, heels, hiking shoes, boots, athletic shoes, and others. The heels should not exceed one inch to ensure safety and the proper fit. All shoes should be flexible and breathable. The proper back to school shoes, regardless of the type, has to fit properly for support, comfort, and performance. This means the shoe shouldn’t need to be “broken in” since a tight or uncomfortable fit is a sign of an ill-fitting shoe. There can be as much as a quarter to a half inch of space between the toe of the shoe to the tip of the toes to give the child’s feet room to grow. Most children grow quickly enough that they need new shoes at least every four months, with some growth spurts requiring new shoes every three months. Children need proper footwear and regular checkups to maintain healthy feet. The experts at Michigan Podiatry can provide care for infants, school-aged children, and adults. Contact a knowledgable representative online to schedule a back-to-school exam for comfortable, active performance throughout the year.